Dorie Greenspan got us a soup that can do both. We love a hearty meal that can warm us up when it’s snowy just as much as we crave light and fresh eats on sticky summer nights. 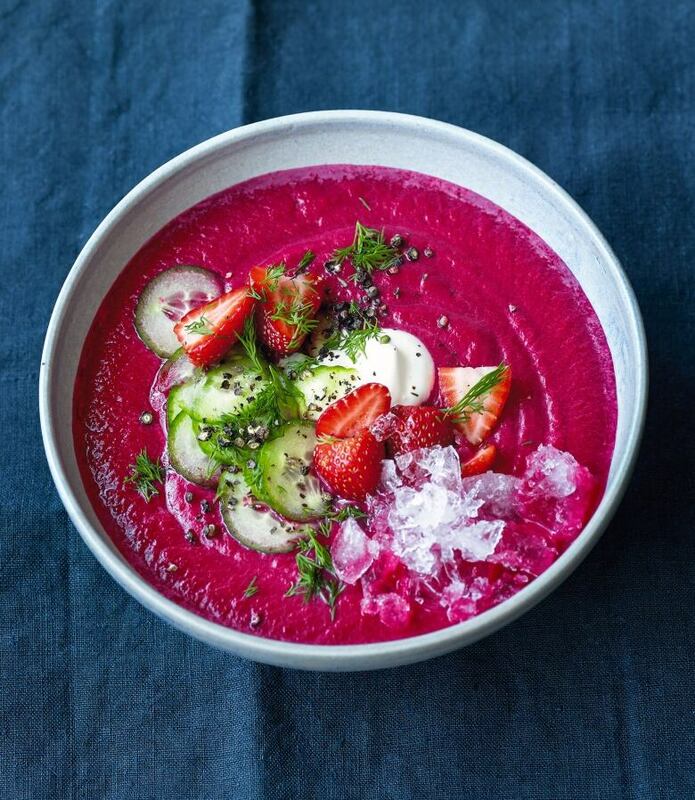 But few recipes can satisfy in all seasons like this beet and fennel soup from Dorie Greenspan’s cookbook Everyday Dorie. Made from a blend of humble vegetables and herbs, the versatile dish can be served hot or cold, depending on where the weather (or your mood) guides you. Be sure to share it — that striking red hue demands to be seen by dinner guests, family and co-workers alike. I love when you can get a mountain of flavor from a molehill of ingredients — in this case, beets, fennel, onion and garlic. I first made the soup in late spring when, with the enthusiasm that overtakes me as soon as new vegetables come into the markets, I’d bought too many beets. I roasted a bunch, pickled a few and then made this soup, which I continued to make through the summer and into fall. It’s good at every temperature, but I think my favorite is cold. The strawberries were a last-minute inspiration and an inspired choice for both their color and their sweet-acidic pick-me-up flavor. You can serve the soup straight from the fridge or you can double up on the chill, as I do, by pouring it over ice cubes. Sometimes I serve soup-on-ice in highball glasses with a straw, but most of the time I ladle it into bowls and finish them with a scoop of thick Greek yogurt, a few cilantro or parsley leaves, cucumber coins and some strawberries. Pour 1 tablespoon of the oil into a Dutch oven or large saucepan and warm over low heat. Add the fennel, onion, garlic and herbs, if you’re using them, and cook, stirring, until the vegetables soften, about 15 minutes; if you need to, add a little more oil. Season with salt and pepper. Add the broth and beets, turn up the heat and bring to a boil, then lower the heat and simmer, partially covered, for about 45 minutes, depending on your beets. Don’t be impatient — the beets must be easily pierced with a knife. To puree the soup, use a blender, either stand or handheld (immersion), or a food processor. Working in batches and discarding the spent herb sprigs when you come to them, puree the soup, giving it just a minute more than you might normally in order to ensure that you get a silky texture. You can serve the soup hot or let it cool a bit and then refrigerate until it’s thoroughly chilled before serving. If you’ve refrigerated the soup, stir it before serving. Hot or cold, the soup is good with any of the suggested toppings; the strawberries are especially good when the soup is chilled. For the cold version, I like to put a couple of ice cubes in the bowls (or glasses) before I pour in the soup.